The Travelon AT Classic Messenger Style Crossbody bag keeps your belongings safe with RFID blocking card and passport slots. This bag has front zip pocket and zip mesh expansion pocket for holding a water bottle. It has Front and rear snap close slash pockets with locking compartments and slash proof straps. 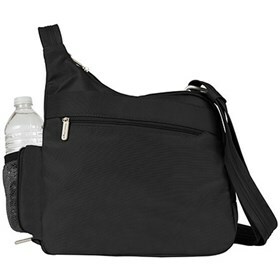 The Travelon Anti-Theft Classic Messenger Style Crossbody - Black has many exciting features for users of all types. You can extend the lifetime of your Travelon Anti-Theft Classic Messenger Style Crossbody - Black with the purchase of a FactoryOutletStore Factory Protection Plan. See the Travelon Anti-Theft Classic Messenger Style Crossbody - Black product video and gallery images above for more details. The Travelon Anti-Theft Classic Messenger Style Crossbody - Black is sold as a Brand New Unopened Item.